Kenwood is arguably the most popular brand in this list. It has been in the car audio industry for decades. Those years of experience are in full showcase with this subwoofer. It is made of a heavy-duty polypropylene cone with a tough rubber surround. It can handle up to 400 watts RMS. 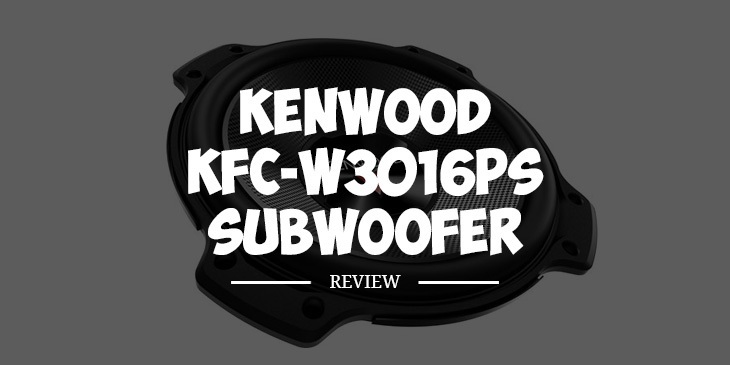 Kenwood put out all the stops to design this quality sub. It has a dual ventilation system that ensures it can stay cool despite long playing sessions. The cone is also reinforced so that it won’t flex during heavy bass production. I recommend putting this in a sealed enclosure and paired with a nice amp to get the most out of it. The manufacturer recommends putting this in a sealed enclosure. It specifies an optimum internal volume of 1.25 cubic feet. According to Kenwood, putting this in a sealed box would enable the sub to handle a lot of power. It can also translate to accurate sonic reproduction. It can also be put in a ported enclosure if you desire to improve its efficiency. However, the downside is that the sub will have a low-frequency output. This subwoofer has a textured polypropylene cone. Due to the material used in the cone, it won’t easily flex even when you crank the bass levels. The cone also has a square array pattern that makes it all the more rigid especially during long playing sessions. The woofer has spring post terminals on one side, which is where you connect to the wiring of the amplifier. These posts are where you can connect bare wires, single banana plugs, and pin connectors. Kenwood makes use of an advanced heat transfer system for this sub. It has a dual ventilation system which can keep the motor cool. This, in turn, improves the power handling of the sub and ensures that it can continue working for a long time. Its top mounting depth is less than six inches (5-3/16″ to be exact). While this is not the shallowest in this list, it is still good enough to be placed under the seats of most mini trucks and SUVs. Q. What is the recommended amp for this subwoofer? A. You’ll get a one year warranty for this subwoofer. Although there are reports that this sub can blow itself after a few months of use, I am still recommending this subwoofer. It is hard to discredit the good reputation of Kenwood,what with the years it has been in the car audio business. I also give this subwoofer extra points for being designed with some of the advanced technologies of Kenwood like its heat dispersion system. The cone is also very rigid and should take alot of beating.